The Road to Freedom and a Large Brick House. Gdansk, Poland. 27th May 2014. Finding my way out of Berlin was easy enough although it is always difficult to leave friends behind. It was great to see Segun again and I was very grateful to Ralph for his help and hospitality. But the needs of the journey soon take over and it’s equally good to be on the move again. Once over the Polish border the roads narrowed down to single carriageway. The wind had picked up, with a stiff breeze blowing across the flat countryside. I was heading towards the Baltic coast and the port of Gdansk. As you’ll have gathered the events in communist Europe figured heavily in the news broadcasts of my adult life and events in Gdansk were no exception. More of that later. Meanwhile I was enjoying the ride and the sun had come out to replace the earlier showers. This was just as well for the two Layby Lovelies I spotted, each one standing by a track leading into some woods. They were all done up in a way that no country girl would be on a weekday, hoping for some trade from the passing traffic. Not a great way to earn a living. I rode on. Gdansk introduced itself slowly but surely as the landscape changed to straggly, slightly rundown towns. I found, and booked into, my hostel, settled in and went out for something to eat. I had the best meal I’d had on the whole trip so far; double celery soup with crispy bacon and peanuts followed by pork tenderloin. Really delicious and quite cheap at £12. “I think I’ll quite like Poland if the food is this good.” I thought. Next day I followed up on my reason for coming to this large industrial city which, on the face of it, isn’t high on Poland’s list of beautiful places to visit. But it is the home of the Lenin Shipyard, the place where the death knell of communism first sounded. 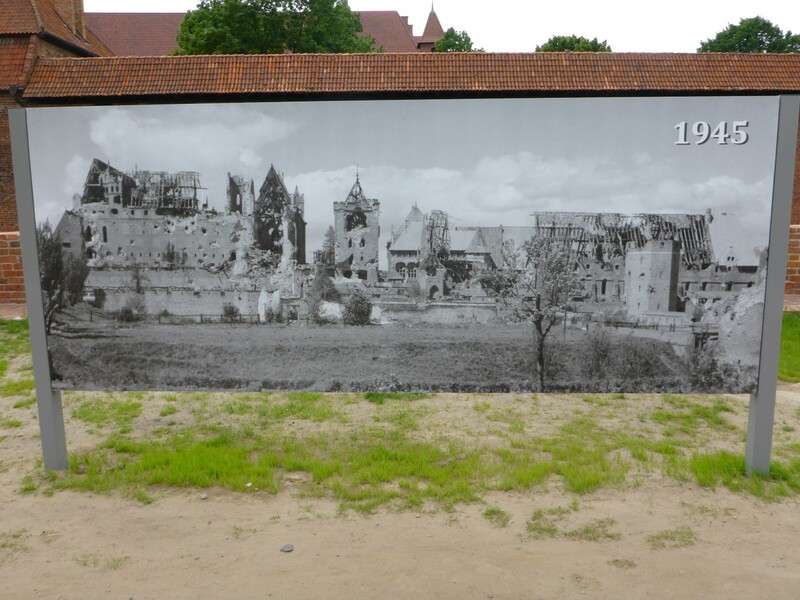 It was a logical step to me, having enjoyed Berlin’s history of its wall, to visit the place where that wall’s foundations were first shaken nine years earlier. It’s beautifully ironic that the death of communism began in a shipyard named after the man who gave it birth. Outside the Road to Freedom Exhibition. Poland has a history of protests and uprisings against the communist regime but they usually ended in bloody violence, mass imprisonments and sometimes the deaths of protesters and police. In the fifties, sixties and seventies many such strikes and protests had taken place on the streets with dire consequences. Lech Walesa was an electrician at the Lenin shipyard and was sacked for his trade union activities. He was one of the leaders of a group of workers who wanted to form an independent trade union, something definitely not allowed by the communist system. His colleagues went on strike, demanding his reinstatement and official recognition of their union. Unlike in previous strikes, they didn’t take to the streets, where violence would have been a certain result. Instead they organised a sit in at the shipyard. The leaders locked the gates and relied on the support of of their friends families outside for food and supplies. Walesa joined them inside and organised many of the pro strike activities that took place. Eventually the authorities gave in and Poland’s first trade union was allowed to form. Solidarnosc was born. It eventually garnered 10 million members, one quarter of Poland’s population, and they were spread across all trades in the country. But in 1981 the authorities, under pressure from Russia, cracked down on the freedom movement by introducing martial law. Solidarnosc was banned and Walesa arrested, along with many others. This was back to the bad old days and martial law lasted 16 months before the regime ended it, partly due to international pressure. But Solidarnosc was still banned and Walesa, free once more and reinstated as an electrician, worked with others in an underground movement to support trade union activities. They used many of the propaganda methods employed by the communists themselves, including newspapers, leafleting and so on. 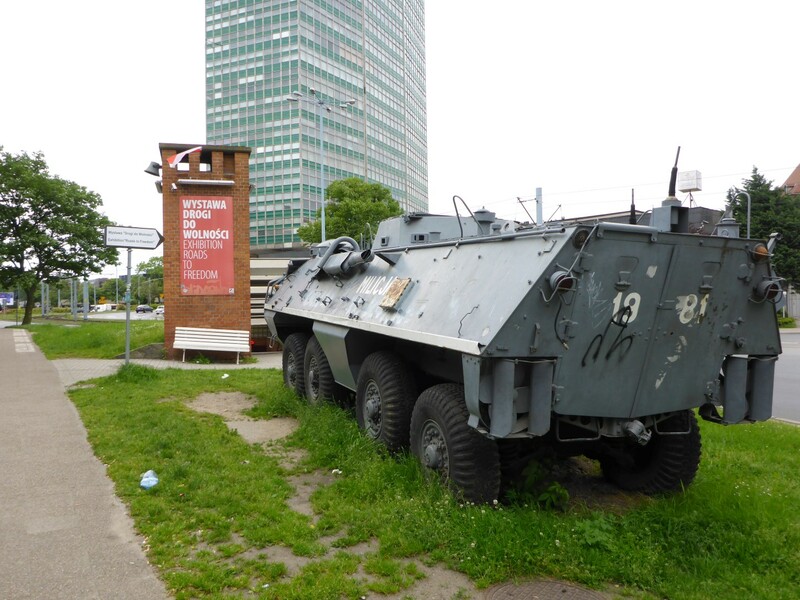 Eventually the authorities relented, an amnesty for Solidarnosc activists was granted and the freedom movement started to progress once again. 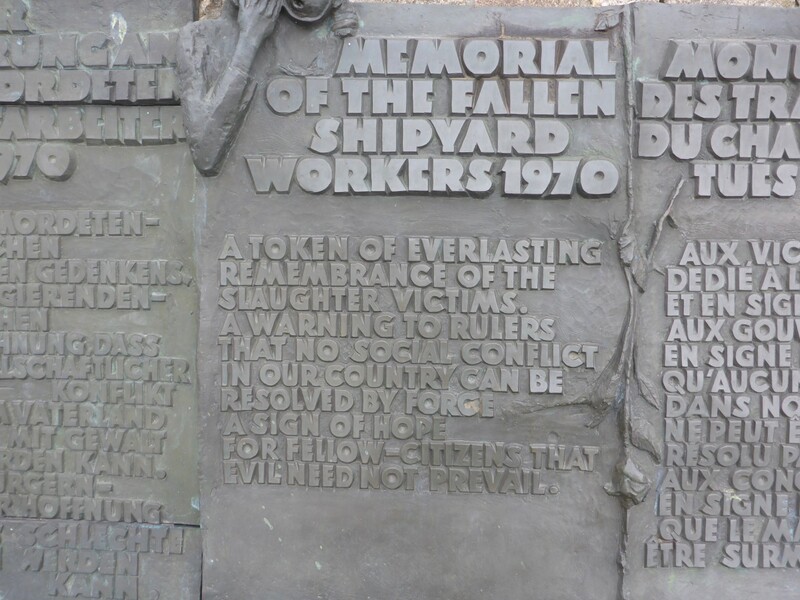 The twenty one demands made by the shipyard workers. In early 1989, following yet more food price rises and the resulting protests, the government agreed to enter into round table negotiations with the trade union and others. Out of that came Poland’s first semi-free elections where 35% of the Sejm (Parliament) and 100% of the seats in the newly reinstated senate could be freely fought for. Lech Walesa didn’t stand but he was the key figure in the campaign. Every Solidarnosc candidate used election literature with themselves and Walesa photographed together and slogans demanding change. The best the communist candidates could do was use slogans such as ‘Why rush into change, trust the people you know’. Solidarnosc won every seat bar one in the senate and all the available seats in the Sejm. Following the elections Walesa persuaded leaders of the other parties to form a non-communist coalition government with a non-communist prime Minister at its head. The first such government anywhere in the Soviet bloc. It was in December 1990 that elections were held for the new position of President. This time Lech Walesa did stand and won easily. His presidency had its problems but whatever his failings – and he had many – he set in motion the important market reforms that Poland needed as well as instigating the processes that led to NATO and EU membership. These were hugely important events for Poland but equally as important for the rest of communist Europe. It took about two years for all the other communist regimes to fall but once Poland had changed, the rest was inevitable, with East Germany being the next to do so. 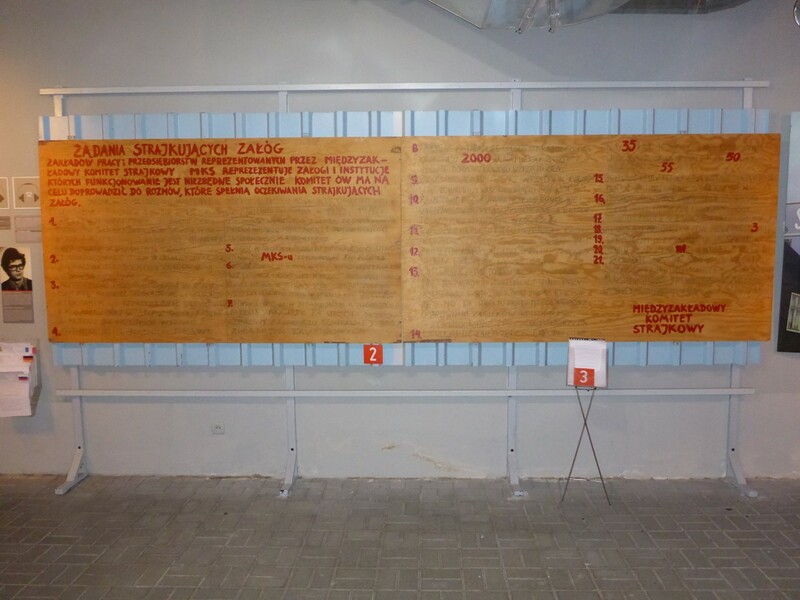 The place where this history is presented is The Road To Freedom Exhibition and is well worth a visit.It traces the story of the trade union Solidarnosc and all the events that led up to Poland’s independence. Very well worth a visit. I would recommend it because of the historical importance of the story it tells and also the human one too, about people so determined to improve their situation that they’ll risk everything to achieve it. Humbling. 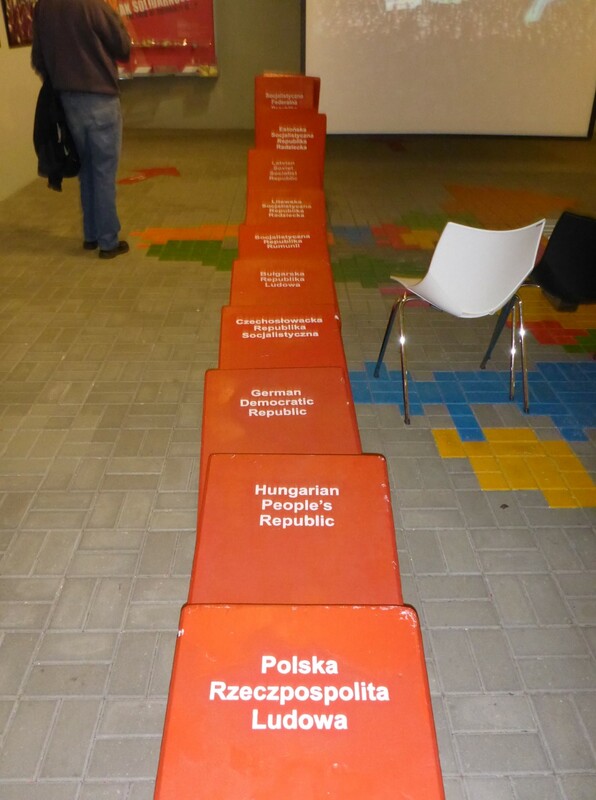 A model portraying the domino effect of Poland’s freedom. 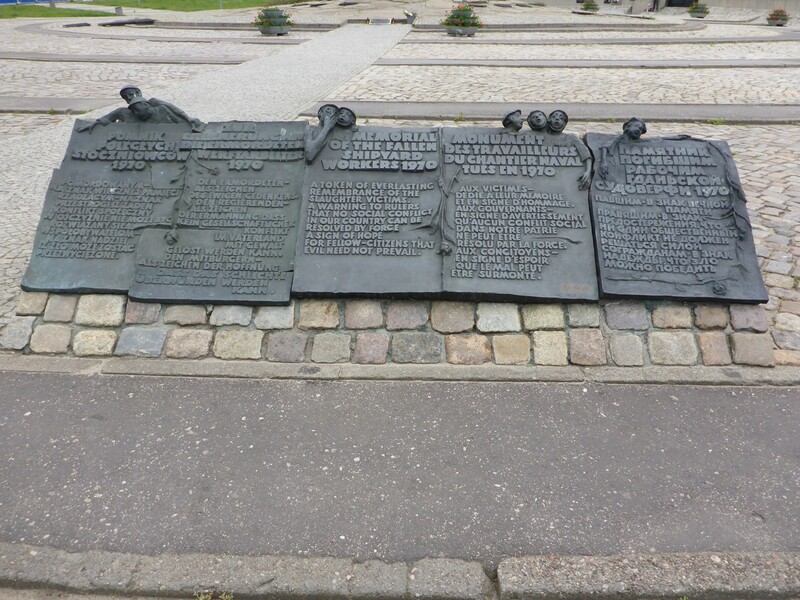 Across the road from the exhibition is a huge memorial to Polish protesters in general, and those from the Lenin shipyard of 1970 in particular, who lost their lives while seeking freedom from communist oppression. I spent the rest of the cold and blustery day walking around the older part of city. There are some nice old buildings to explore although I just looked from the outside this time. I did note that there is a large amount of renewal taking place with old 19th century apartment blocks being torn down and new ones going up. New roads are being built too. My first impressions of Poland as I rode across to Gdansk were of a country still needing investment. As with Czechia, I saw towns with some areas that were old and shabby, like Britain in the Eighties, so it was good to see renewal under way post communism and post 2008 crash. A reminder to repressive leaders everywhere. Monument to the Polish People who fought against the communist regime. When I stayed in the Ambrosia Hotel in Ypres I discovered that one of the owners is Polish and she kindly gave a list of places she thought worth visiting while I was in the country. This effectively became my Polish agenda and after leaving Gdansk I headed to the first item on it. But before arriving there, a tale of caution. The motorway out of Gdansk became a toll road. Approaching the barrier I pressed the button for a ticket. Nothing. Pressed several more times – several more nothings. So I gave up and just rode around the barrier. Further on I came to a pay station. Because I didn’t have a ticket showing where I’d joined the toll road the woman demanded the full amount, 25 Zloty instead of 5. I tried to explain to her that I couldn’t get a ticket. No English and no dice. I parked the bike out of the way, stomped around a lot, argued some more and ended up paying. She wasn’t giving in, I had to, or I was going nowhere. In fairness I don’t suppose she had any other option but that didn’t make me feel any better at the time. Next time I came to a toll barrier I still couldn’t get a ticket. It seems either my bike isn’t heavy enough or doesn’t have enough metal mass to trigger the sensor that says there’s a vehicle there. This time I pressed the HELP button and they issued a ticket manually. I wasn’t planning to pay five times the toll a second time! 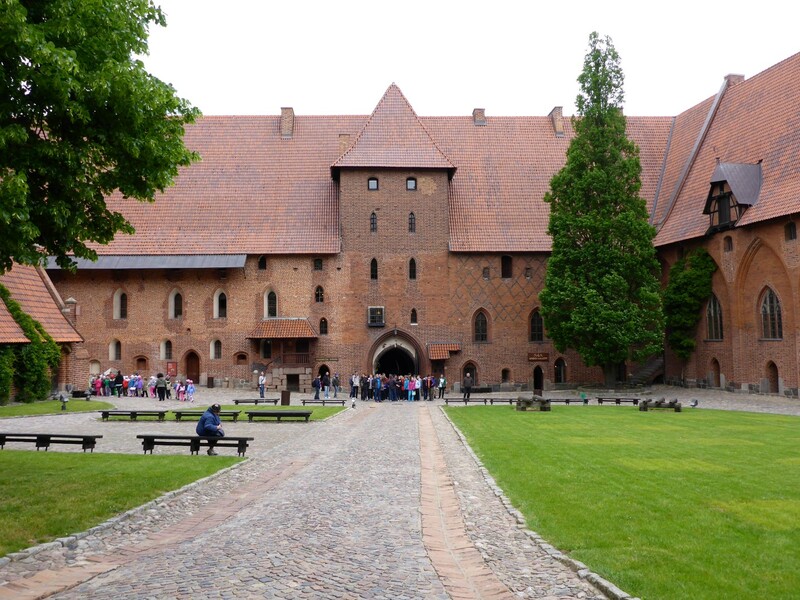 Malbork (Marienburg) Castle was built by the Teutonic Order of Knights and is reckoned to be the largest brick built castle anywhere. The Teutonic Knights, or the Order of Brothers of the German House of Saint Mary in Jerusalem, to give them their full title, was a hospital order formed to aid pilgrims to the Holy Land. Later they added a military order and this was the role they took in Europe. They were heavily involved in Crusades into Pagan Prussia and Lithuania from their base in Poland, starting in the 13th century. They set up the Monastic State of the Teutonic Knights, based in Poland, and continually added to their conquered lands and their economic power. They were involved in trade, mining, levied tolls and became a naval power in the Baltic Sea. During the 15th century they began to lose battles against their neighbours, lost the support of the Pope and went into gradual decline. They remained active in the catholic areas of Germany until Napoleonic times. Today they act as a charitable organisation in Germany. 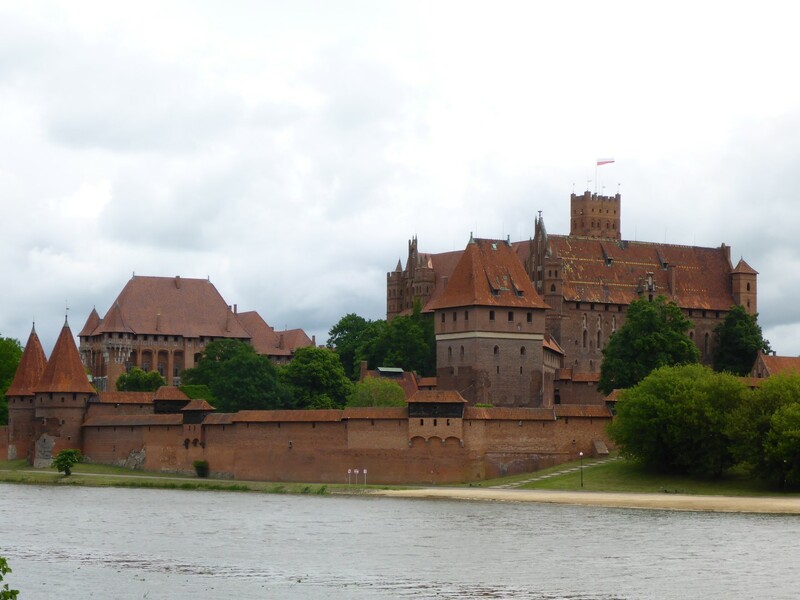 Malbork Castle from across the river. The castle looks fantastic from across the river and was even better once I’d parked the bike and walked across the bridge to it. A brief history. Started in the 13th century it was added to as time went by and became a hugely important economic and military base. It became the seat of the Great Masters of the order and was the base from which crusades were launched into Lithuania and other places. It was also a centre of renown for its feasts, games and tournaments.These attracted Knights from all over Europe. An external view of the castle. Following the crisis of the monastic orders of the time, and the Polish Peasants’ Revolt, it changed hands to the Polish kings in 1457 and then to the Prussian empire in 1772 when they conquered the western part of Poland. 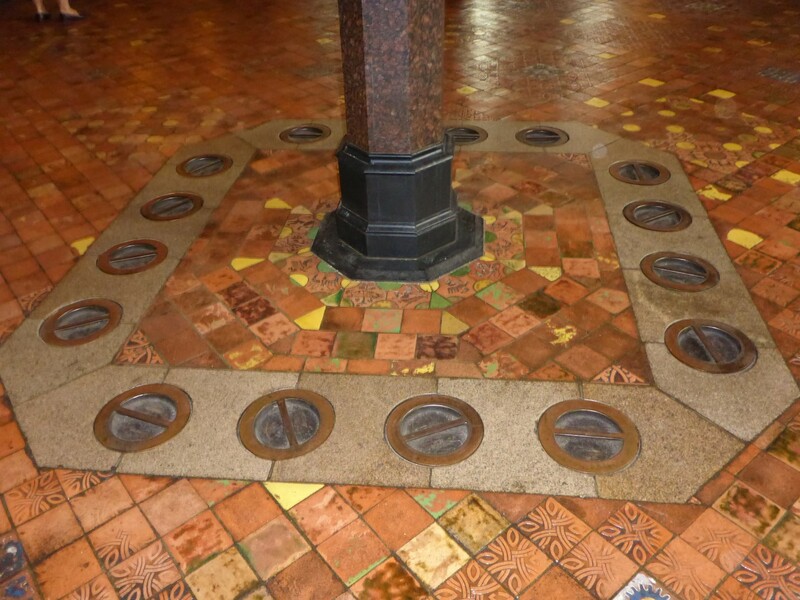 It fell into disrepair during this time but was refurbished in the 19th/20th centuries. Unfortunately it was badly damaged during WWII but has been restored since and is a major tourist attraction. 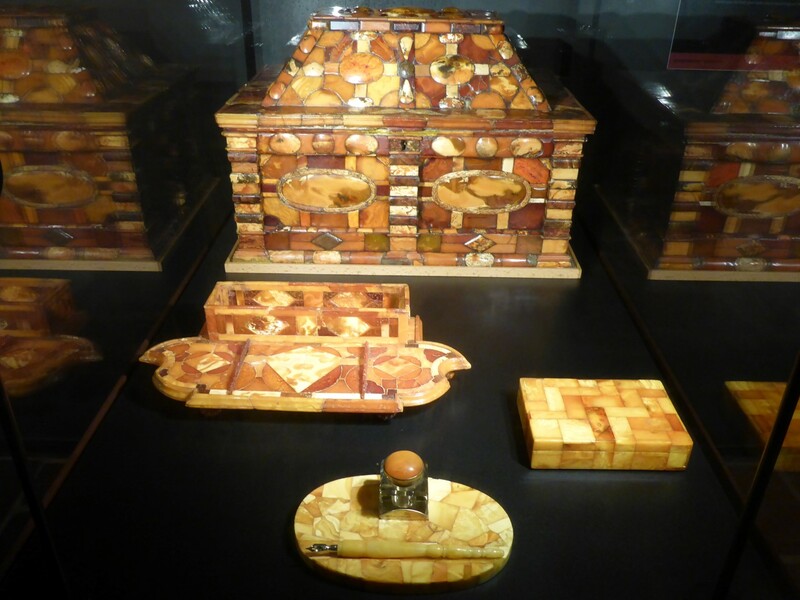 As well as the castle itself visitors can also see an amazing collection of objets d’art made from Amber, which was heavily mined in the area. Amber is a semi-precious stone that was formed over the millenia from tree resin which was them compressed into rock. It was mined for its beauty and medicinal properties. 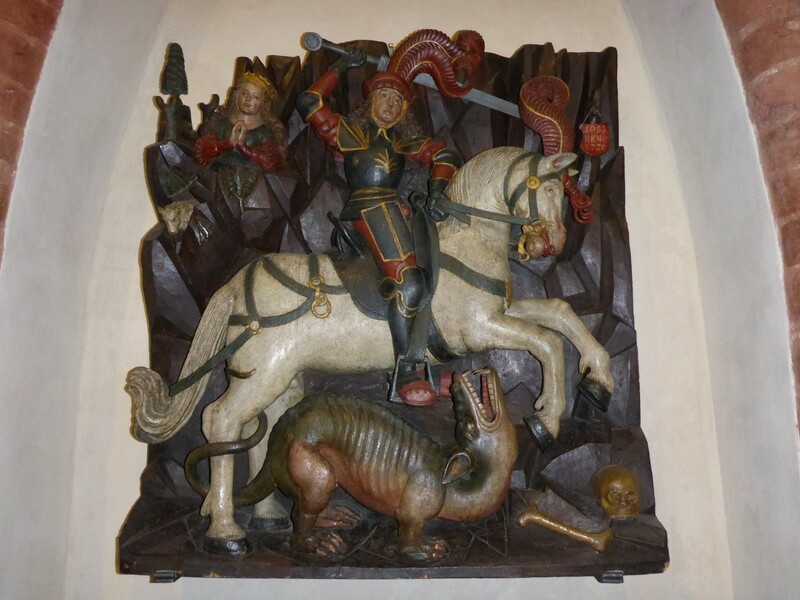 The Teutonic Knights relied on it for a large part of the income they derived from this area. I spent about three hours walking round the castle with an excellent audio guide to explain everything.There are many interesting features there, especially the huge refectory, and several collections of military, archaeological and general history, as well as the aforementioned amber. I like a castle, and this one is fabulous, but as well as that I began to learn something of Poland’s early history and started to make links between that and some things I’d learned elsewhere, especially Czechia. 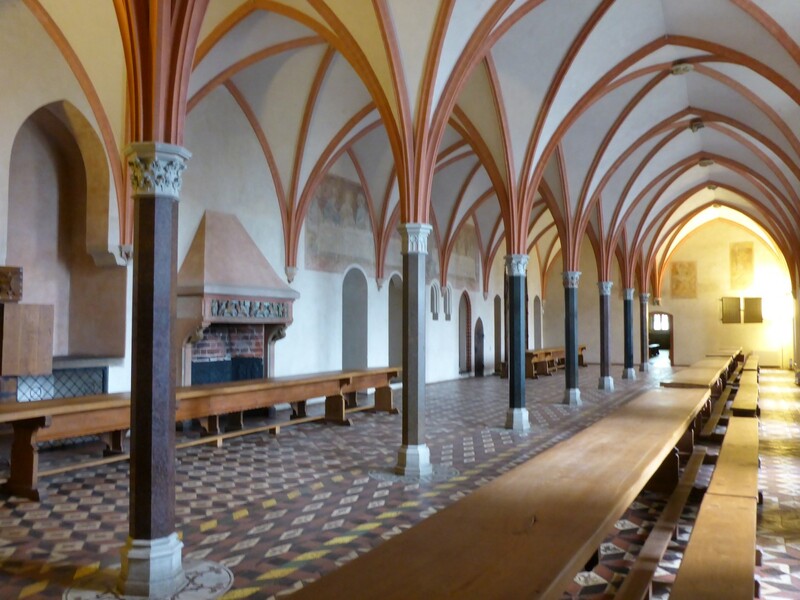 The huge and impressive Refectory where the Knights entertained visiting dignitaries. Warm air central heating, even in the 14th century. If you thought amber was just a traffic light colour, think again. A fascinating interval on my journey south but a warm hostel beckoned and I needed to move on. Great writing, again 🙂 But it’s a bit frustrating knowing how much further you’ve now moved on and how much of your excellent story still awaits!